For the last few years, Collins Memorial Library has participated in the annual McCarver Elementary School visit to Puget Sound. Coordinated by Amy Ryken, Professor and Dean of the School of Education, and Monica DeHart, Professor of Anthropology, the annual trip brings McCarver 5th graders to campus to learn more about the college experience. During their visit, the elementary students are exposed to many different programs and facilities on campus, including the Slater Museum of Natural History, Norton Clapp Theatre, and Memorial Fieldhouse. The library is always happy to host the 5th grade visitors and this year we brought them upstairs to the Archives & Special Collections. Our visitors viewed a selection of our most rare and valuable books and manuscript leaves. 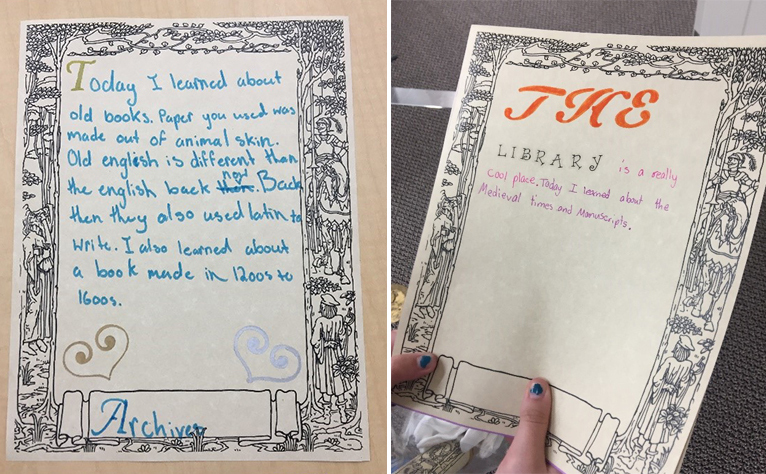 The students learned about the arduous process of creating a medieval manuscript by hand—the process of creating vellum from animal skins, making ink from minerals and plants, the work of scribes to write the texts, and the art of illuminating (or decorating) the manuscript pages. The Archives & Special Collections holds examples of both illuminated manuscript vellum leaves as well as replica copies of rare texts that live in museums and archives in Europe. Next, our students were encouraged to make their own illuminated manuscript page. 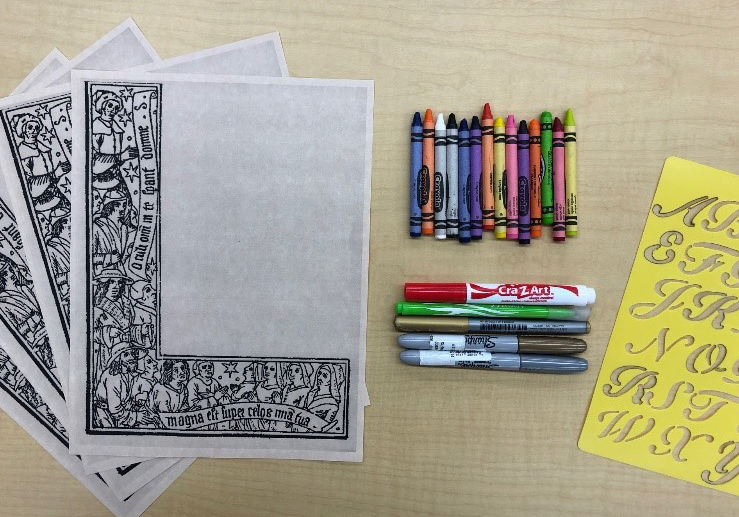 They had pre-printed pages with fanciful borders that they were encouraged to decorate and make their own with markers, crayons, silver and gold pens, stencils, and stickers. It was a fun and creative process that allowed students to create their own special and rare object. We were thrilled to host the McCarver Elementary 5th graders and we cannot wait until next year’s visit!